It takes passion and courage as well as a great deal of time commitment to start and sustain one’s own business. Recently, I spent an afternoon with Jaimie Perkunas, owner and primary teacher at the beautiful “Yoga is Therapy” studio where I am honored to Balance, Bones and Core weekly classes and Yoga for Healthy Aging workshops.We enjoyed Indian food for lunch, talked, and played on the yoga wall. 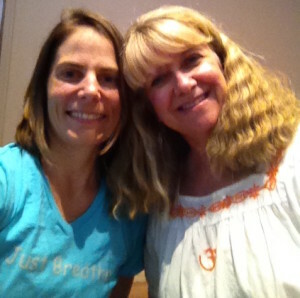 “Yoga is Therapy” just celebrated its one year anniversary and I thought it would be a great time to introduce you to my friend, the brilliant and innovative Jaimie Perkunas. Two yoginis with Illinois roots: Sandwich and Chicago. vhs tapes . I remember my Dad practicing yoga in the middle of the living room, on his own by candlelight. When did you start your yoga practice? I started practicing in college. I practiced with my Dad’s Bryan Kest power yoga tapes after gaining the college weight. When I did savasana I noticed increased contemplation. The studio is about the intersection of yoga and physical therapy. My husband encouraged me to open up my own studio and he helped build it. My mission is for myself and other teachers to provide a therapeutic form of yoga, to know what is safe and comfortable so students can practice safely in the community. I want to help other yoga teachers to incorporate more therapeutic awareness, and for health care providers to incorporate more yoga into their practices. I personally offer a Complete Back Care class at the Yoga Wall, Release your Knees, a Hip Help class, Happy Back and Align and Refine, and Yoga for Newbies, among others. Note: The “Yoga is Therapy” website contains the complete schedule of workshops offered by Jaimie, myself, and other enthusiastic and highly qualified teachers. 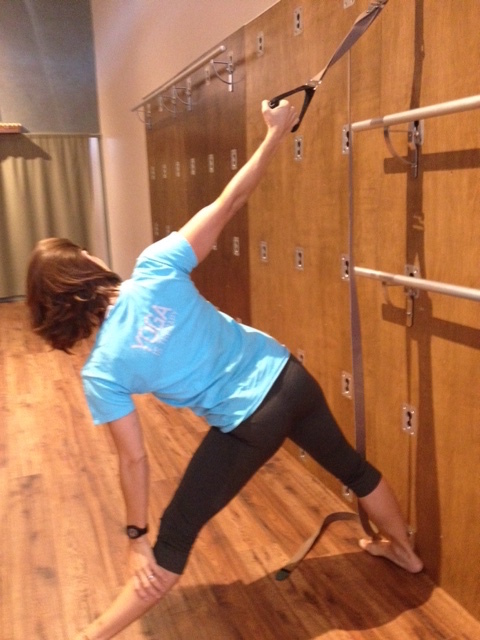 Jaimie demoing triangle at the rope wall during my mini-training in yoga rope wall for prenatal and balance yoga! It was a transition from being a PT. PT is very regulated for insurance coverage. In yoga there are less defined regulations. Bringing yoga in has helped to be less strict; meet people where they are at; there is more room to be flexible with yoga within the therapeutic focus. Who are your main teacher yoga teachers? I completed teacher training with Darren Rhodes and Christina Sells in Tucson. Rachel Krentzman is my current main teacher. I also have a variety of mentors including Staffan Elegid and Matthew Taylor. What vision do you have for your therapeutic yoga teaching path? To provide a space for: ceu training for health care providers that incorporates yoga, therapeutic educational classes for yoga teachers, educational classes for the public on safe yoga practice. I want students to go into any class and practice safely.